Steve Hunt, ISSA Distinguished Fellow & Hall of Fame inductee is a strategic executive advisor to global companies. He will share his multi-year research revealing keys to creating a resilient security operation with high employee retention and executive buy-in. You'll learn how the best organizations measure the maturity of their security operations and how you can do the same in order to show quick improvement to C-level executives. 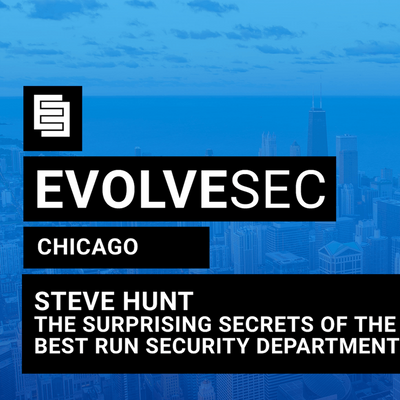 This entertaining presentation will be useful to security professionals, end users, vendors and consultants.About Steve HuntSteve Hunt is an executive strategist, advisory board member at Evolve Security Academy, and faculty member in Communities of Excellence who is passionate about mentoring the next generation of security leaders. He founded the Chicago Chapter of the ISSA, Served on the ISSA International Board of Directors, was elected Distinguished Fellow, and inducted into the ISSA Hall of Fame. CSO Magazine presented him with the “Industry Visionary” Compass Award.He founded Communities of Excellence in 2016 to promote mentorship and performance excellence frameworks within the security industry. Steve is a popular speaker at business and security conferences around the world. He also appeared as a homeland security analyst on CNBC, Fox News, CNN, and other news programs. His analysis has appeared in the Financial Times, Wall Street Journal, The New York Times, Business Week, and other global publications and trade magazines. Steve attended Elizabethtown College and was a graduate fellow at University of Chicago. Steve’s diverse background lends a fresh perspective on business and society.Pizza and refreshments will be provided! You make music, Now what?